A brief visit to the mall-like hospital known as Medical City on Ortigas Avenue was followed by lunch at the nearby Tiendesitas, an upscale cluster of huts with specific products, stalls and spaces according to a theme. It's only Tutubi's second time at the place since it's not his interest to visit "snobbish" places like this, frequented by moneyed people and or tourists/balikbayan compared to the mass appeal of Greenhills Shopping Center, both owned by the same people. On entering the place and parking his car, he proceeded to the Food Village near the entrance of the road of Frontera Verde, a quick scan of restaurants in front of him locked on to the ginataan ulang (freshwater prawn in coconut milk) with kamias (an endemic sour fruit) and laing (taro leaves in coconut milk, a Bicolano specialty). Despite Tutubi's comment on high prices, Tiendesitas, is a great place for foreign tourists and ex-pats to discover the best of the Philippines under one roof and offer safe and clean place to stroll even window shopping. Dubbed the best Tiangge in Metro Manila is probably true to most people if you can stand the usually higher prices offered here, Tiendesitas is a cluster of large huts or open-air bahay kubo with evaporative condensing airconditioners. Owned by the same people behind the Greenhills Shopping Center, Tiendesitas caters to the higher income bracket people due to the higher prices of goods but beter facilities and less people. If you're looking for other food trips and tiangge with less cash, better visit Salcedo Weekend Market in Makati on Saturday mornings, Legazpi market also in Makati, Lung Center Market on Sunday mornings, and Banchetto in Ortigas Center. Commute: There are jeepneys plying Cubao and Pasig City that pass by the place. From Manila and Sta. Mesa, G-Liner and RRCG buses pass by Ortigas Avenue but you need to walk towards Tiendesitas. Same route as jeepneys plying Pasig/Tanay (Rizal). There are free shuttle rides from Greenhills Shopping Center, but Tutubi still needs to verify the schedule. From Quezon City via C5, Tiendesitas is just near the corner of C5 and Ortigas Avenue, a palce called by commuters as IPI, but the entrance is the road shared by SM Hypermarket (Supercenter). From QC via EDSA, take left on Ortigas Avenue via the flyover, drive straight until you see the Frontera Verde on your right and just on the takeoff of the flyover over C5. Tiendesitas is about 200 meters from there. I have wondered about that, when an email friend said that she and a friend had a place at a Tiangge. Then her partner afterwards quit as she got a job as a stewardess. It's a good thing, though, that there's a cleaner place for tourists to experience the down home-like atmosphere of our tiangge. That would be one of the places I would go to, if ever I visit again. Wow, seems like another cool place to hang-out! 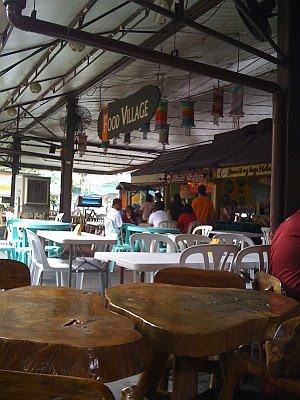 We were in the Philippines (Manila) last April but we sure haven't paid a visit to Tiendesitas. We sure will next time! Thanks for posting this! i was there last friday night. what i like about the place, naka-group siya. di nakakahilo unlike sa greenhills. malapit ka lang sa west ave? hindi pa ako nakakapunta ng tiendesitas kahit taga mandaluyong lang ako. haha. pero mukang masarap yung pagkain dyan ah. natatakam ako sa prawn nila! I always take Julia Vargas to SM- Ugong which is near Tiendesetas coz my bank is near SM. It's just last week when I tried entering the area from Ortigas extension. It was night that time and I say the stores and restos are classy. Clean, decent place. You also get to have a good view of ORTIGAS Business district...nice, nice place. i've been there once.. kasi ive seen it on tv a couple of times. and when we passed by i told my partners i wanna see what's there. hehe. kaya ayun.. they obliged naman. it's a nice place.. medyo mahal nga lang.. pero it's nice. nakakatuwa ang antique village sa tiendesitas, may nakita akong electric fan from the 1920's na gumagana pa rin. nice shots from here. sana pala kasunod ka na lang tido. by the way, i highly recommend wake/knee boarding. tip is just to keep yourelsf a waste. basta may gata ayos na ayos. kaya yang shrimp na may gata patok na patok yan. thedong, i've already tried wakeboarding at Lago de Oro in Nasugbu, batangas. haven't been to CWC though. 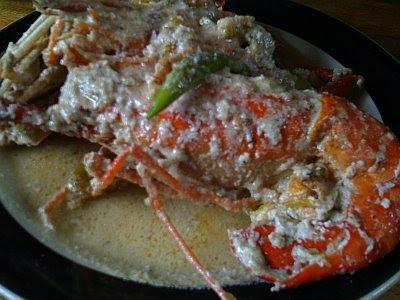 the ulang looks so delicious. medyo mahal nga lang kaya ako na lang magluluto ng ganyan sa bahay. very detailed info bro, great job. Well, I always want to see everything, both the touristy and the locals places to get a whole picture of a place. The shrimp pic look good enough.... Yummy. i used to visit the place and see the pets. the dish looks very tempting!!! now i'm craving for 1. Thanks for this post! I'd like to use this info for my blog. I wrote a recipe on how to make Vigan Empanadas and I first saw the stand here at Tiendisitas.